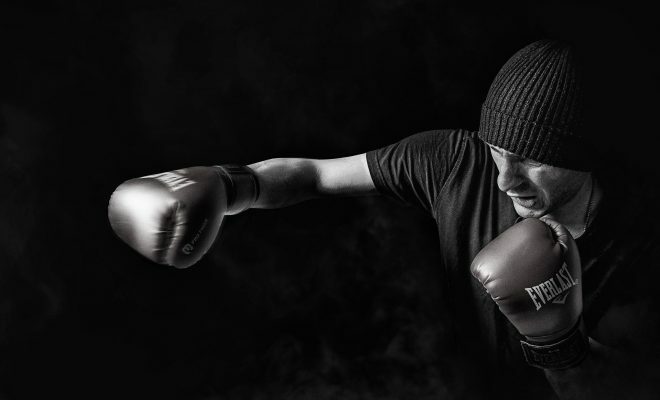 In this article we will show you how TaskBlast is used to manage a practical product release. Different projects can have different contexts and those will drive which methodologies and workflow’s suit best. We try not impose any particular methodology or processes on your team, you can decide what works best for each project. 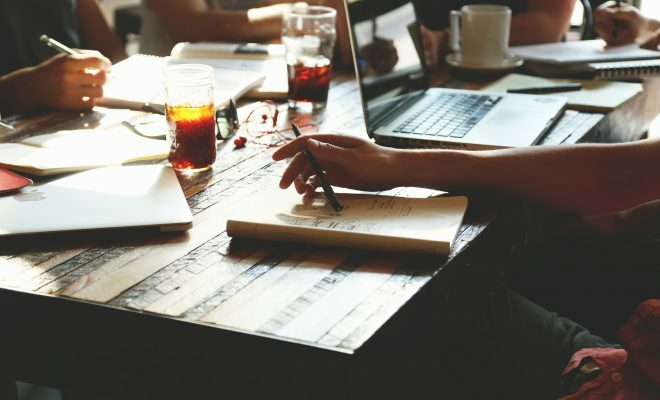 With that in mind, this shows several methods for managing a project while making the best use of TaskBlast and we hope it will help you decide the best processes for your next successful project. The project is to build a small app page. There will be 3 elements to the project. To deliver a successful launch all 3 projects need to be finished together. For our first project the end result looked like the image below. It follows the flow of moving issues from backlog to development to completed. Of course, you can adjust the layout to add as many or as little lanes as you want, edit lane names and all this can be done directly on the Kanban view. As you can see in the image above, we have restricted the backlog to a max of 50 issues and the development lane to a max of 10 issues at any one time. This allows me to keep the project size manageable. 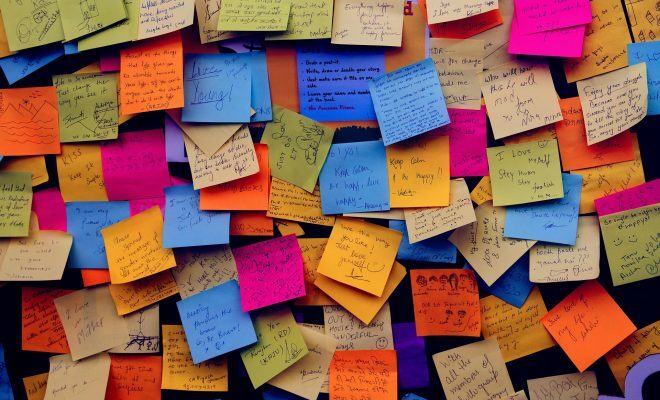 With a deadline, it’s not realistic to have more than 50 backlog items so this forces the team to think about how important an issue is before adding it to the backlog. Is it really necessary for the launch or can it wait until later? does it really add enough value to merit being included? This forces the team to ask those important questions, that they might not have otherwise asked when these restrictions are applied. Having a max of 10 issues in the development lane encourages developers to work on only one or two issues at a time and it also encourages them to have issues which are held up addressed so they can free up space to add more issues. There are rough examples but you can adjust them to suit your teams’ needs. After putting so much work into creating this layout, we want to use a similar layout on my other 2 projects but it is a bit of a pain to have to repeat all those steps again. The good news is we can use templates to avoid this and save a lot of valuable time. we simply go to settings and choose which project we will use as my template. Now when we create a new project it will duplicate the layout (lanes and sub-lanes) we have above. You can also clone the milestones and sprints layout too from this section. Now that we used templates and the Kanban to quickly create the 3 projects. We might want to use milestones and sprints to break the project into smaller more manageable chunks. Milestones are often a larger goal such as beta or official release and sprints are smaller development cycles of typically 1-2 weeks. Sometimes urgency is lost if the goal is an official release in 6 months, but with a 1-week sprint the urgency is real and the goals are clear and achievable. Once you have your to-do list ready. Your next step is to plan the project. This will help you to get an idea of the size of the project and when its expected to be finished. We have 3 possible ways to do it, using estimates, the Gantt view or with the schedule view. You can use a combination of these also. Let’s dig into each one and see how they work. Developers can quickly add estimates to a task via the Kanban view by clicking on the calendar icon. Once all the estimates are in place you can make some basic estimates by dividing the total hours to complete the project by the number of hours per day your team has available. If you want to get more specific and you are using sprints, then the sprint progress view can be very useful for getting more accurate projections. Open the left sidebar, click on the sprint progress tab and then click on sprint stats. This combines all the important information together to help us make an accurate assessment of when the project should finish. 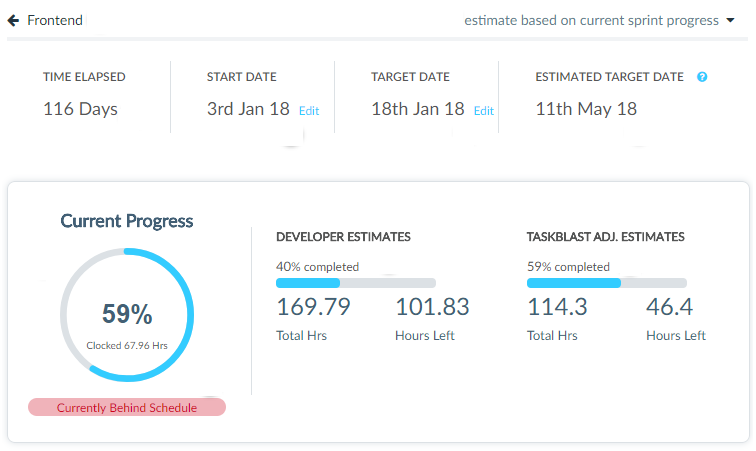 The target date is the personal target we want to achieve and the estimated target date is the date TaskBlast believes the project will finish after taking a number of things into consideration. How it makes those estimates are by analyzing the current data project and also the previous history from developers estimates and actual hours clocked. It then makes adjustments so that if Tom keeps saying 5 hours and delivering in 10 hours, then it will adjust all his estimates accordingly. The developer estimated hours can be seen on the left and TaskBlasts adjusted hours on the right. The Gantt view is synced with the other views so any updates made to tasks in the Gantt view will immediately be reflected in the other views and vice versa. Keeping a project on track is crucial to ensuring a successful project is delivered on time and on budget. There are several tools which will help you to identify bottlenecks early on in the process so you can react before it puts a project deadline at risk. In the Kanban view and other views, there are some useful filters that can help identify potential bottlenecks. A good course of action is once a day to run through several of these filters to identify issues in advance. 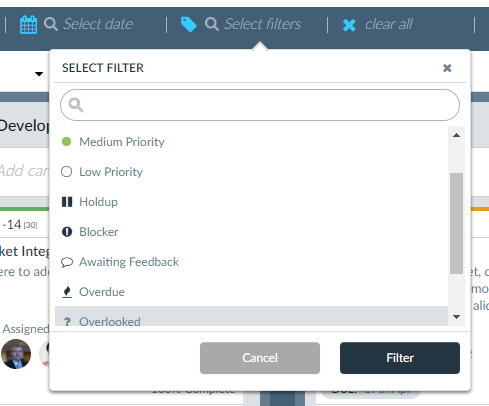 The filters we found most useful to run through are: urgent priority, holdup, blocker, awaiting feedback, overdue, unassigned, and overlooked (no updates for over 2 weeks). By reviewing those we can make sure that there is nothing blocking any of the issues and we would usually ping the assigned user and ask for an update if things appear to be stalling. This avoids the scenario of finding out a week later that a certain task didn’t move to the next stage because they were waiting on a 3rd part to deliver specs. We found this type of pre-emptive monitoring had so much value we wanted to create easier ways to access this information and so the next 2 features showcase two such ways. The automated assistant (coming soon) frees up valuable project manager time by automating the previous process. For example, if a task is unassigned for more than 1 day, it will automatically ping the slack chat representing the project manager with a message such as: Hey, HT-1384 is unassigned, who is available to take this task on? Another example, if a task is due in 3 days, it could send an @mention to anyone assigned the task and say “Is HMT-2476 still on track for completion in 3 days”. These types of interactions can make a huge difference because the followups are instant and instead of finding out there is an issue 3 days later when the task is overdue, this allows the project manager to address any holdups immediately keeping the project on track. The high-level overview is another way to make the task of filtering to find potential bottlenecks easier. The overview shows a recap of how many potential bottlenecks there are and with one click it groups those into one view. From here you can click on each issue and investigate further. 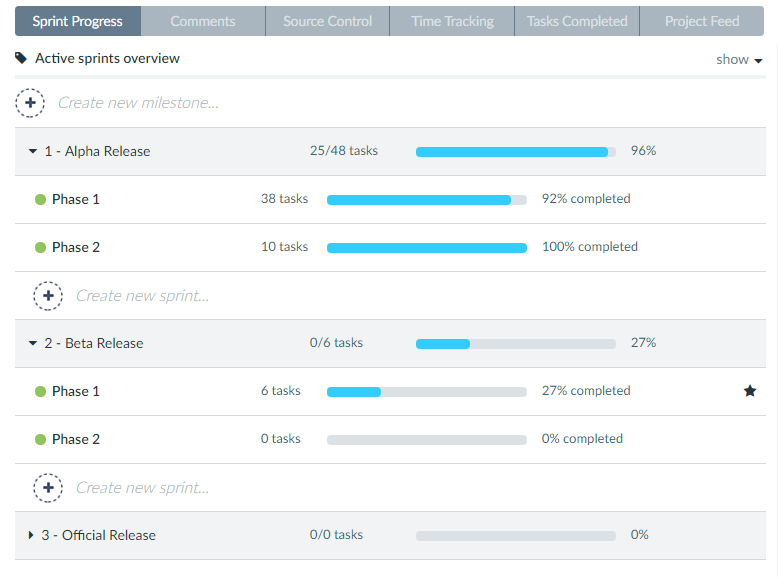 The overview shows all projects on one view and you can even filter to show specific sprints within each project. Keeping a project deadline on track is important but equally important is tracking that a project budget is also on track. In the previous video, you can see that it also summarizes the project’s budget for each project. The time tracking report also helps you filter by project and you can then group the results by task or by the user. You can drill down further and filter by sprints, dates, and tags. This helps you keep a firm eye on the budget breakdown in various areas of the project. Let’s look at how users enter the information with our global time tracker. This makes it easy to see what the active timer is from any view. You can also start a new timer from any view for any project and quickly find a task in any project, all from the timer. Unlike other tools, this is included in the per-user price and it is seamlessly integrated avoiding the complications and confusion associated with implementing API’s and integrations. Another important aspect of keeping a project on track is better collaboration. These are the tools that help your team to collaborate better. 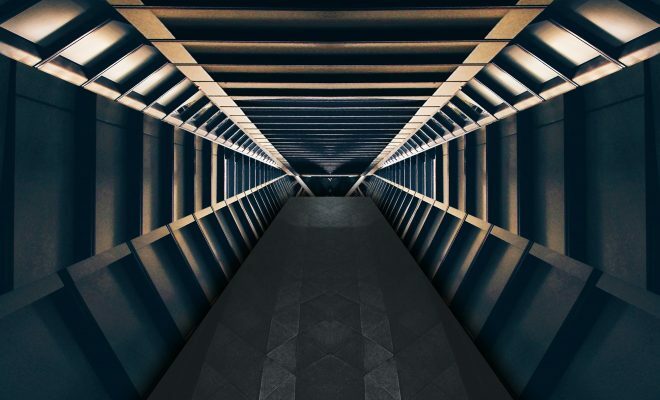 TaskBlast has its own standalone comments section however for those that use Slack you can set up a two-way communication between TaskBlast and Slack. Just sync a project to a slack chat and all chat from Slack will sync to TaskBlast and all chat from TaskBlast will sync to Slack. You can also setup notifications to slack. If a task is completed or a new task is created, it will send a notification to a slack chat of your choice. TaskBlast integrates with both BitBucket and Github. There are several elements to the integration. Once connected you can choose to display commits from any branch in the source control tab in the left side menu. You can also use smart commits which allows you to put commands in your commit messages which instructs TaskBlast to do certain actions such as add a comment to the issue in TaskBlast or move a task to the “ready for testing” lane. TaskBlast notifications send you email notifications when a task is assigned to you or when a task you are assigned to is updated, a notification is sent detailing the update along with some critical info such as priority, sprint, assigned user etc. For those of you that hate email notifications, you can turn it off in settings. Mentions work just like slack, facebook etc. You type @ and then get a list of team members. If you choose a team member they will get a notification that someone mentioned them in a comment with a link to the task and comment. To make the launch successful, we need to simultaneously complete the 3 projects at the same time. The product project needs to be ready but also the landing page projects needs to be ready to promote the product and the marketing project needs to be ready to drive traffic to the landing page. This is one example where you can have multiple projects that all share the same release version. 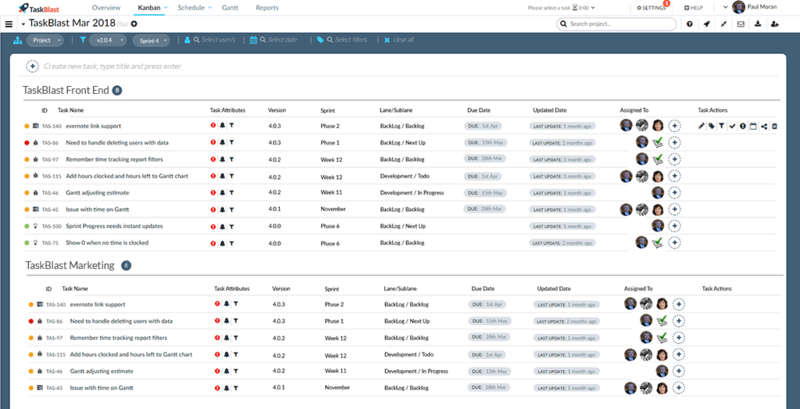 To manage such a situation, the releases view will help you plan the release in one view. The Kanban board can only show 1 project at a time but assigning a version is global so it can be applied to tasks in multiple projects. 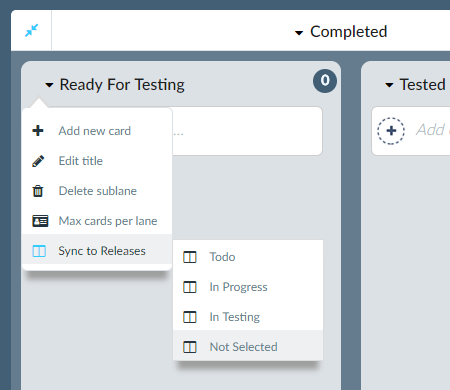 You can assign a task to a release version via the filter icon on any card as shown below. 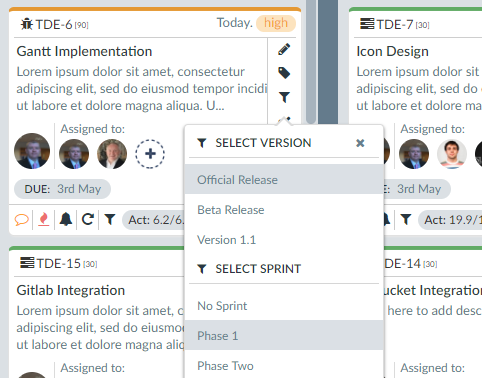 The releases view has 4 lanes, todo, in progress, in testing and finished. Since lanes and sub-lanes can differ across projects we use the current task state to determine where they are in the release process. To manage this across multiple projects we allow you to set the state to either todo, in progress or in testing. When creating a new project, it will automatically set this up for you but you can change it by clicking on the sub-lanes options and choosing which lane to sync to. Once the release is ready to be published, you can click on the releases drop-down and choose archive. This will automatically move any opened items in the release to the finished lane and mark them as closed. Once a version is archived it will no longer show in the drop-down for releases but you can still open it to review the tasks grouped under that release. This concludes how TaskBlast can be used to manage a product release. It was meant as a guide to demonstrate various ways you can get the best out of TaskBlast but every company and project is different and you might use a different variation to manage your project. Hopefully, this gives you some new ideas and if you want to trial TaskBlast feel free to click on the button below and start trialling it for free. TaskBlast is a project management platform tailored for software teams. We make TaskBlast simpler by focusing only on the features software teams need ensuring they have the power of Atlassian with the simplicity of Trello.